It is time to rethink your typical classroom presentations… think Explain Everything. This app allows teachers to create by providing an interactive whiteboard and a screencast tool in one place. Using this app, presentation slides can include a variety of media- from websites and drawings to pictures and videos- Explain Everything has it all. Sharing your creations is simple, and screencasts can be shared and exported as videos, PDFs, and Explain Everything project files to programs like Dropbox, Google Drive, and YouTube for viewing on and off of the Internet. 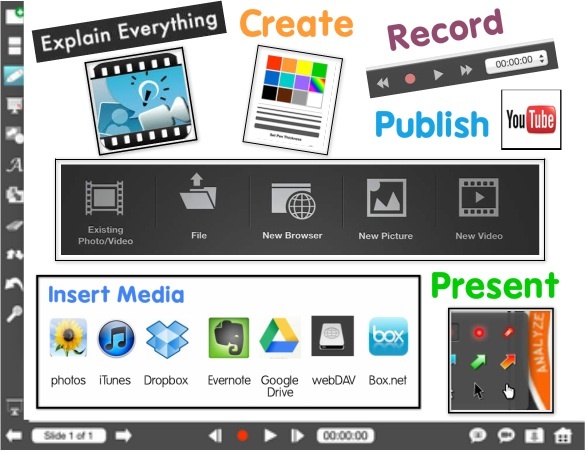 Explain Everything offers different presentation formats to meet the needs of all learners. Flexible viewing options also allow the teacher to control how screencasts are viewed. Teachers can provide students with the option to control the pace at which a Presentation is viewed, or it can be viewed and paced at the teacher’s timing. The uses for Explain Everything is the classroom are plentiful. Teachers can use the app as a learning medium that includes a variety of rich media, and videos and images created on other apps are easily imported. Students can also assume the creator role using this app by constructing and sharing their knowledge while creating Explain Everything screencasts of their own. Furthermore, formative assessment opportunities are created as both teachers and students can share and respond to the same screencast when the file is shared as an Explain Everything project; thus allowing for instruction and responses that include text, video, audio, and more. Explain Everything is also a great medium for utilizing the flipped classroom model as screencasts provide student-centered learning opportunities that can be viewed and responded to at home and in school. Finally, why not connect with parents using this app? It is a great way to send home announcements and homework help tutorials. Contact me to hear how we have used Explain Everything in our 1:1 classroom… and I’d love to hear how you have or how you see yourself using Explain Everything in your classroom! “My pencil is broken!” Words we hear and panic- the seemingly quick exit ticket is complicated by materials, and is taking time away from valuable teaching and activity time. Yet, as a teacher that knows the value of formative assessment to drive future instruction, you are not willing to give it up. Below are 2 pencil free assessments that are easy enough to use in your classroom tomorrow. Materials needed: 1 student plicker response card per student, 1 teacher mobile device. Using Plickers, students hold up a specific side of their printed Plickers card to indicate their answer. The teacher scans all of the responses at once, using a phone or tablet, for an immediate visual representation of correct and incorrect student responses. After viewing student answers live, a visual report of all responses is available online. Plickers is great for immediate feedback as well as for exposing individual student’s misconceptions, as each student’s card is different than anyone else’s in the class. The app recognizes the individual cards, and reports back to the teacher the answers for whomever the card is assigned. If you teach more than one class per day, the Plickers website allows you to organize students and reports by class. The same paper cards can be used from class to class, as long as students use the permanent card number assigned to them in their “class” on the Plickers website. Plickers is free to download and use, and can be downloaded for both iOS and Android devices. The Plickers cards can be printed in varying quantities for free from the Plickers website, and laminated versions can be purchased from Amazon. The concept of these is simple, students tear the sheet of paper along the dotted line to indicate their answer. It is a quick and easy task, and easily shows you what misconceptions students may have. These are great to pass out during lesson close, and as students exit the gym they drop their assessment in the bucket or hand it to the teacher. Tear assessment slips are not limited to lesson closure either- they are easily used at the beginning of class and during transitions from instruction to activity and the slips are easily reviewed as collected. Although you will not know which students submitted which slip, you learn which concepts to revisit or reteach after reviewing the assessment responses. Customize and print your own using this template (4 assessments per page). What strategies have you used to formatively assess students in the classroom? Share the pencil free assessments have you used in your classroom. Voicethread is a communication and presentation platform that provides a multi-sensory learning experience for users as they learn and share information. Voicethread presentations allow users to create slides that include images, webcam video, and voiced audio with the capability for webcam comments to be added and seen right in the presentation. 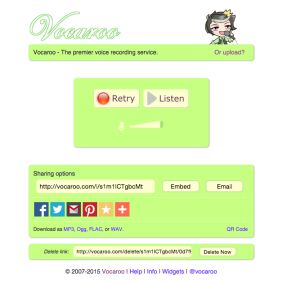 Voicethread can be accessed from computers, tablets, and mobile devices. Voicethread is a great learning medium in the classroom as it provides a collaborative learning environment. Students can join a teacher’s “group” or “class” to easily access Voicethread presentations. In addition, presentations can be shared as a link, embedded on a web page, or posted on Facebook or Twitter. With a premium membership presentations can be exported to a file. Privacy settings on presentations allow users to control who can view and comment on a presentation. Students do not need an account to view a Voicethread presentation, yet require an account to comment. Aside from teacher’s using Voicethread to teach content to students, there are many uses in the classroom. A few are discussed below. Voicethread allows students and teachers to communicate via comments posted on a Voicethread presentation. Comments can be added to individual slides, allowing for specific feedback to be given and may be posted as video, audio, or text. This facilitates a collaborative learning environment, as students can construct and express knowledge through meaningful comments posted on a Voicethread presentation. Not only can students communicate with students in other classrooms, but they can easily communicate with students in other schools. Such a capability makes it a great medium for learning different perspectives and for research projects focused on geography. Student groups can work together to create a unified Voicethread presentation. Working as a unit, groups select the media necessary to successfully share their knowledge. Communication and executive functioning skills will be developed as a group makes decisions and develops their plans for creating their Voicethread presentation. Throughout a unit or semester students can add slides to their Voicethread, documenting their knowledge and thoughts during the learning process. This can act as a future resource for review and contemplation as the student looks to apply learning while also providing the student and teacher with indicators of growth. How have you used Voicethreading in your classroom?